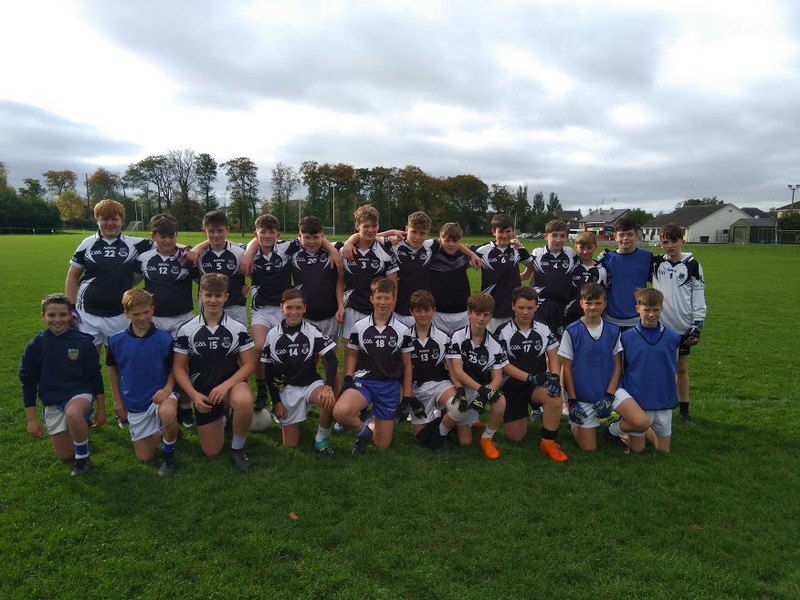 It was a cold and very windy Tuesday morning in Sallins GAA pitch, when our u14 boys took on Piper’s Hill in their first match of the season. Our lads had the disadvantage of playing against the wind in the first half, but this didn’t seem to bother them. After conceding some early scores half forward Charlie Doyle got the first score of the game for St. Paul’s. The Piper’s Hill forward line was looking very strong in the opening fifteen minutes but this didn’t seem to faze our full back line. Some brave defending from corner backs Cole Grattan and Kevin Cleary put huge pressure on the Piper’s Hill forwards. With the wind at their back, Piper’s Hill tried to lob balls into the square but some smart play from full back Eoin Callan meant the pressure was eased as he burst out and cleared his lines. Our goalkeeper Luke O’Reilly had a hard task with kick-outs against the strong wind, but half backs Adam Brennan, Edward Boland and Adam Lavin made life easy for him by taking the short ball and working it out. He made a fantastic save late in the half when a Piper’s Hill forward was put clean through. Our lads showed great heart and kept fighting and three well taken points from midfielder Joe Walsh kept the pressure on Piper’s Hill. Full forward Oisin Bannon was working hard for the team and they pushed on. Midfielder Sebastian Oglinzeanu won stole a Pipers Hill kick out and scored a crucial goal for St. Paul’s to the bottom corner. This was quickly followed by a top corner goal from Charlie Doyle; this meant the lads were leading by only one point at halftime with a score line of St. Paul’s 2-04 to Piper’s Hill 2-03. At the start of the second half Piper’s Hill got their second wind as they scored three unanswered points within the first ten minutes. However, some great work from half forwards Stephen Whyte and Cian Reilly fed ball into the full forward line and once again Charlie Doyle got the score board ticking for St. Paul’s. Substitute Jamie O’Connor won some great ball and fed his inside forwards to great effect. We started to gain momentum and points from Keelan Meredith and Cian Reilly saw the two teams level once again. Substitute Eoghan Slattery made a fantastic block late on to deny Piper’s Hill a probable goal. Piper’s Hill scored two very well worked points but some great work by Thomas Dunne in the full forward position settled our lads. Charlie Doyle answered back by scoring 1-02 in the dying minutes of the game to see St. Paul’s win their first game by 3-11 to 2-08. St Paul’s Got Talent 2016.